There’s a lot that goes into making your driving experience pleasing, fun and enjoyable every time you press on the gas pedal, which is why vehicles such as the 2018 Mazda3 have made such an impact on the automotive market. 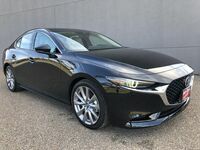 Available in both hatchback and sedan configuration, the 2018 Mazda3 can provide you with a luxurious, refined, sleek and – perhaps most of all – fun ride every single time you grip the wheel. This has made it an endearing model to many automotive consumers of today, and if you’re interested in becoming a member of the Mazda family, you can get the 2018 Mazda3 today in Edinburg TX! If you’ve had your eye on the 2018 Mazda3, come join our Bert Ogden Mazda sales team as we take you through what this compact icon has in store! By now, we’re betting that you’re interested in seeing the Mazda3 for yourself. If so, feel free to contact our sales team at Bert Ogden Mazda today and schedule a test drive. We’re always happy to show you what we know about the model, as well as get you credit pre-approval if you’re ready to drive it home!